It’s been about a year since the GoPro HD Hero2 came out and it’s time for it to retire – the new model, Hero3, is smaller, lighter and faster. It comes in three different editions called White, Silver and Black. All three editions come with Wi-Fi built-in (so you don’t need a the Wi-Fi BacPack) and are compatible with the Wi-Fi Remote (which is included in the Black edition package). The top of the line model is the Hero3 Black, which has a 12MP sensor and can shoot up to 4K video. There are two versions of 4K – 3840×2160 (TV’s Ultra High Definition) that can be recorded at 15fps and 4096×2160 (a movie-making standard) at 12fps. Of course, those aren’t suitable for high-speed action, so you can shoot 2.7K (2716×1524) at 30fps, 1080p at up to 60fps, 720p at up to 120 fps and all the way fown to WVGA at 240fps. The Black edition is priced at $399 and comes with a waterproof Wi-Fi remote which can control up to 50 cameras at once. It’s $99 if bought separately, but you can use the smartphone control app instead. At the low end is the White model, which still stacks up well against the HD Hero2. It has a 5MP sensor and can shoot video at up to 1080p@30fps. This one is priced at $200. In between is the Silver model – it’s capped at 1080p@30fps but its sensor is 11MP and costs $300. 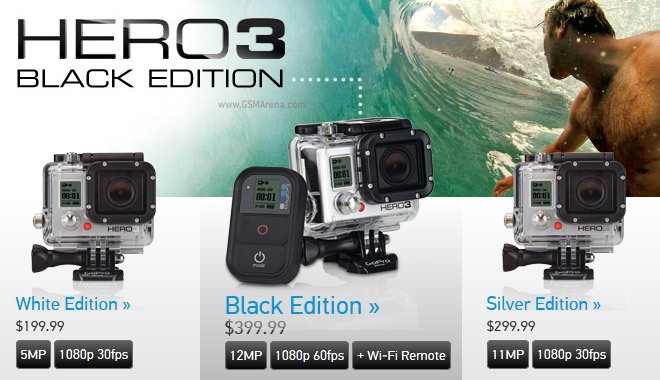 Head over to GoPro’s web site for more info. Note that at the moment it has some issues and the link to the silver model points to a non-existent page (this should be the right one). The cameras are currently on pre-order with an estimated shipping date October 22 (next Monday).